When I’m out in the fields checking on my herd, I can’t always be sure that my cell phone will work. We live in a very desolate area, and cell phone service is often hit or miss. I don’t like to take chances, so I make sure that I have the best two way radios I can get my hands on. That way, if my family needs me, I’m just the push of a button away. See, the thing about cell phones is they rely on cell towers. Those towers provide coverage over an area, but the cell signals can be blocked by various geographical features. Have you ever tried to place a cell phone call when you were in the basement of a building? Now, imagine that instead of being in a basement you’re in an area where there are a lot of natural features between you and the cell tower. The result is much the same. On the other hand, good two way radios are capable of sending and receiving signals in a wide variety of situations. They let me talk to my wife back at the house, even when my cell phone shows no signal. They let me have the peace of mind of knowing that no matter what, if I need to contact the house all I have to do is push a button and talk. Of course, as with anything else in life, your specific needs may vary depending on the situation you’re in. Fortunately, we carry a solid selection of two way radios. Take some time and look through them; compare the features you want with the various features we offer. And, of course, if you have any questions about radio please don’t hesitate to pick up the phone and call us, or send us an email. We’re here to help you keep in touch with your family, and using two way radios is a great way to do that. 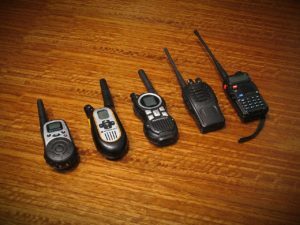 This entry was posted in Product Blog and tagged communicating radio, two way radio, two way radios, walkie talkie radio.